After a hot-and-cold managerial track record, Claudio Ranieri etched his name into legend when he took a Leicester City side fancied for relegation and miraculously guided them to a staggering Premier League title in 2016. But the man who gained plaudits and admiration from football fans around the world with his smiley, eccentric attitude, has lost himself in the managerial merry-go-round ever since. Nine months after he delivered the Foxes their most coveted piece of silverware, Leicester took the harsh, albeit understandable decision to sack Ranieri. It was an astonishing, unforeseen decision from Leicester's managing directors after the club endured a reality check; finding themselves in the midst of a relegation battle halfway through the following season. Craig Shakespeare took over, guiding them to mid-table safety before he himself was sacked just eight months later. Having departed Midlands club in February 2017, Ranieri endured a testing spell in France with Ligue 1 club Nantes. Despite guiding the club to a ninth-place finish, Ranieri struggled to nail down a working relationship with club president Waldemar Kita after a series of disagreements. The Italian allegedly ‘challenged‘ the club to sack him if they weren’t happy. But according to Kita, the decision he made to sack Ranieri had nothing to do with his fractured relationship with the manager. Ranieri had been subject to criticism on certain team selections, but he nonetheless had a positive season in France in terms of results. Only eventual champions Paris Saint-Germain and Montpellier conceded fewer goals than Nantes, and between the likes of Diego Carlos and Emiliano Sala, the Canaries had a gritty, tough-as-nails spine. After his short-lived spell across the English border, Fulham handed Ranieri the baton on November 14, 2018. He took charge of a club who were leaking goals at an alarming rate and found themselves rooted to the bottom of the Premier League. The Italian took over from Slaviša Jokanović, who had managed to achieve promotion with the Cottagers just six months earlier. Despite a record haul in the transfer market, poor recruitment and an inability to adapt to the demands of Premier League football caught Fulham out of their depth. The owners replaced the beloved Jokanović with a man whose last spell in England saw him pull off the greatest miracle in Premier League history. Ranieri had managed the likes of Roma, Parma, Juventus, and Monaco, before lasting a brief spell in charge of the Greece national team, where he failed to get out of the group stage in Euro 2016 qualifying. But this job would prove to be the Italian’s toughest managerial assessment to date. Although Ranieri has managed at the top level of European football, his managerial exploits prove dubious in terms of the period of time he’s endured at a football club. In his illustrious managerial career, Ranieri’s longest spell in charge remains the four years he spent at Stamford Bridge between 2000 and 2004. However, in his fight for job stability, he hasn't always helped himself with his peculiar team selections. In his first spell in the Premier League, he inherited the nickname ‘Tinkerman’ for his continuous change of system and personnel each game. The Fulham owner spoke about the appointment of Ranieri as ‘risk-free’. But in the peril that Fulham found themselves in, Ranieri would have to pull off a miracle tantamount to that of three years prior in order to sail Fulham above the dreaded dotted line. The ‘new managerial bounce’ proved fruitful in Ranieri’s first game in charge. A brace from Fulham’s hitman Aleksandar Mitrović ensured the Cottagers picked up a crucial three points against fellow relegation strugglers Southampton. Despite winning in the league for the first time since August, Fulham’s defensive antics nearly bereft them of collecting maximum points by conceding two goals – something supporters had grown accustomed to in the top flight. 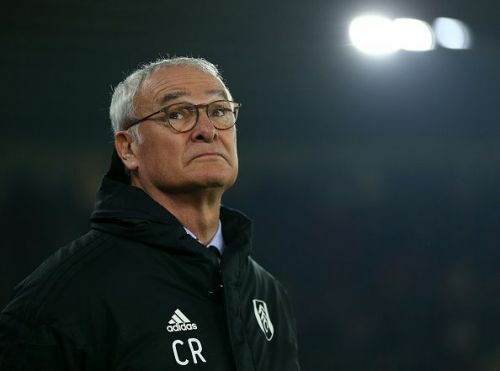 After recapturing the feel-good factor at Craven Cottage in his opening game in charge, Ranieri ultimately failed to fix Fulham’s defensive woes and the 'Tinkerman’ approach that he promised to deliver became a method which was heading on a downward spiral. The results that followed didn’t make for impressive reading either; Fulham only managed to pick up two points from their following six games, and Ranieri struggled to implement his tactical philosophy. Fulham managed fairly impressive draws against Leicester City and Wolves, but they couldn't get the victories they needed to dig themselves out of the cellar. A month after registering his first victory, a solitary goal and clean sheet saw off fellow relegation stragglers Huddersfield before the turn of the year. But a dismal beginning to 2019, which saw the Cottagers bow out of the FA Cup to League One side Oldham, put Ranieri’s job in peril. An inability to eradicate defensive errors from their game and a lack of leadership and organisation put Fulham eight points adrift of safety with 12 games to go. Fulham lost seven out of their eight matches in the first two months of the new year, only managing a lone victory against Brighton. Ranieri was on thin ice. A man famed for his eccentric attitude and contagious smile, ultimately lost his job after the Cottagers whimpered against Southampton and succumbed to a 2-0 loss – a nail in the coffin for the Tinkerman and the final hopes of staying up for Fulham. Many expected Fulham to rise from the trenches upon Ranieri’s appointment and climb their way to safety. But the Italian was in for an uphill battle from the start – his reign at Fulham would have either enhanced or tarnished his credible CV. Unfortunately, the latter is what transpired in his brief spell at the East London club. Fulham’s poor season comes down to terrible summer transfer recruitment. They didn’t follow the model for newly promoted clubs, which is maintaining the core of their promotion squad and not splashing hundreds of millions of pounds on signings. Unfortunately, Fulham took a risk by bringing in new players amounting to a cost of well over the £100million mark. In total, Fulham brought in 15 new arrivals, four of which cost more than £15 million. The minimum expectation would be Premier League safety for such a tremendous outlay in the transfer market, but football isn't played on balance sheets. At the club's disadvantage, Jokanović attempted to brandish the style of football which proved successful at Championship level, but it was simply unfeasible to replicate in England's top division. The vibrant passing style was pretty on the eye, but it was never going to cut it in the rigorous Premier League. The style proved to leave gaping holes in defence, and his side kept on being caught out by trying to play out from the back. The Serbian manager failed to adapt even when his back-line continued to be overflown with goals. Eventually, Jokanović paid the ultimate price for failing to plug up a leaky defense, leaving the club that he had shepherded to promotion just months earlier. Fulham massively overpaid in an overinflated market for players who were unknown quantities at Premier League level. Signings such as deadline-day signing André-Frank Zambo Anguissa from Marseille for £30 million and Jean Michael Seri £27 million, the latter of which had previously been linked to Chelsea and Barcelona. They also signed Alfie Mawson for £15 million from a relegated Swansea side, goalkeeper Fabri for a fee of £5 million and the loan signing of World Cup winner André Schürrle, who has failed miserably at the club despite initially promising expectations. In an interview with German magazine Kicker last month, Schürrle confirmed that his two-year loan would be cut short should Fulham face the drop, although he refuted his claim days later, arguing that his quotes were mistranslated. While Schürrle has admitted that he isn't the type to lead, remarks like that aren't exactly going to fire up your teammates in the midst of a relegation battle. Despite the majority of their signings failing to impress, the only arrival who has made an impact on their team is Aleksandar Mitrović. The old-fashioned battering ram of a centre forward has provided Fulham with a focal point that they haven’t utilised enough, yet Mitrovic has managed to fashion chances by himself on many occasions. As proven last season, when he scored 12 goals for Fulham after arriving in February, Mitrović is too good for the Championship, and it's hard to see him continuing at the club with a bevy of Premier League suitors interested. Without the goals of the Serbian hitman, Fulham would be cut even further adrift at the bottom of the table. His 10 goals this season have had a hand in contributing to 65% of Fulham’s points. A remarkable statistic, one which shows how invaluable he is to this Fulham side. In a season where consistency has bereft Fulham, the two managers in charge of the Cottagers certainly haven’t helped their case. Under Ranieri, Fulham changed their starting formation eight times in his 16 Premier League games in charge, mainly utilising the 4-2-3-1, 3-4-3 and 4-4-1-1 formation in his short-lived spell. There is a time and place to change systems and experiment with new players, but when your team is rooted to the bottom of the table, constantly changing formation is only going to confuse the players. It was never going to be easy for the Tinkerman, but he didn't help himself with his decisions either. Although Fulham spent big in the summer, a team with language barriers and a lack of established Premier League experience will always require a natural leader in order to steer clear of relegation. The Cottagers failed to bring some defensive steel and leadership know-how after reaching a stalemate in negotiations with Gary Cahill. There was also the opportunity to loan in Ranieri favorite Danny Drinkwater, a solid central midfield option, natural leader and former Premier League winner too. Both players are currently out of favour at Chelsea and would have benefitted from regular game time, and both could've made a difference to Fulham’s season by galvanising the squad and offering much-needed steel in areas that the team are crying out for: central defense and defensive midfield, respectively. Thanks to a flawed transfer structure and a lack of defensive organisation, Fulham will almost certainly be going back to the Championship without so much as a fight to stay alive. A season to forget for the fans and the Tinkerman himself.